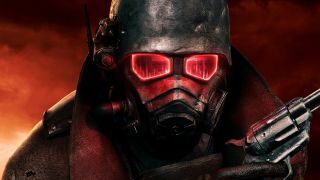 Want to see a guy beat Fallout: New Vegas in 20 minutes? Then you should watch this video of speedrunner Kungkobra, who set a new record by blowing through the entire thing in precisely 20 minutes and 47.6 seconds. The mark is an “Any% Speedrun,” which means he can take advantage of any glitches and exploits, but not console commands or mods, to better his time. And clearly he does, taking advantage of quicksaving and quickloading glitches to skip NPC dialog and clip through walls, and by making use of the amusingly-named “Speedcripple” exploit. As noted on Reddit, the new record is the latest time in a back-and-forth exchange between Kungkobra and Swags_The_Dog, who managed a 20:54.1 run just one day earlier. With the gaps in time growing so small, every second counts, and so the character is built specifically for the task: Female (for the Black Widow perk), 10 charisma, with Speech tagged and the Good Natured trait. It's also why the NPC dialog is in Italian: The Italian voice actors say their lines more quickly than their English counterparts, so the cut scenes play through faster.